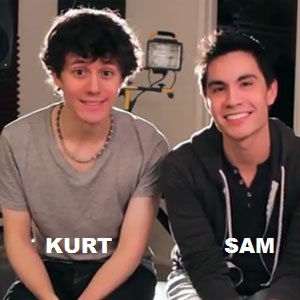 Sam Tsui and Kurt Schneider instantly captured my heart as soon as I accidentally landed on one of their videos on YouTube last year. I consider it as one of the moments that I am thankful for. Cover songs, remakes, new versions or whatever you want to call their videos, all I can say is: their renditions are simply amazing. The best! I can't find the appropriate words to describe the awesomeness of their tandem. I don’t know but... there's chemistry. There's magic. There's something when they make melodies together. See for yourselves. I dedicate this page for their great talent, my love for their craft, and my addiction to their music. Nothin' On You by B.O.B.